This morning's satellite picture (below) is a good place to start today's blog. You can see the low pressure area is now over the Central U.S. However, the flow around the low has pushed a lot of moisture back over Northern California. This moisture will result in more showers and thunderstorms over the higher elevations of the north state today. 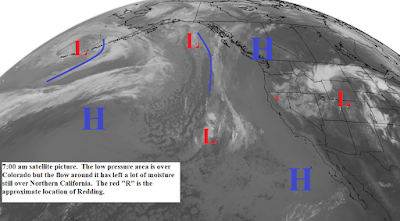 The low pressure trough and frontal system moving across the Pacific is starting to split with another closed or cutoff low forming on the south end of the trough. This low will be off the coast Thursday, over Northern California Friday and into Nevada on Saturday (see map below). Showers and thunderstorms will increase Thursday and Friday over the foothills and mountains with a chance of activity in the valley north of Chico. Temperatures will be below normal and the snow level could dip to 6000 feet on Friday. Saturday looks partly cloudy to partly sunny with scattered showers and thunderstorms over the areas north and east of the valley. Sunday through Tuesday we will see mostly sunny skies with some afternoon cumulus clouds over the higher elevations. Temperatures will warm back to above normal with light winds. The closed lows aren't over yet as some models are showing another one off the coast next Wednesday and Thursday.